The president of Ecuador, Rafael Correa Delgado, an economist and a great friend of Russia came to Moscow on an official visit. Our honorable guest was accompanied by the Minister of Foreign Affairs of the Republic and other officials. President Correa held talks with Vladimir Putin and held a meeting with Prime Minister Dmitry Medvedev, with other VIPs, as well as with Russian businessmen. A number of important international agreements were signed. We shall return later to the theme of Russian- Ecuadorian cooperation. Now we will fast forward and imagine ourselves in this South American country on the equator. What is it like to live in this republic today? What changes are taking place there in the most important and key areas of life? Not so long ago, the government of Ecuador announced a National Plan called "The Good Life” (“El Plan Nacional del Buen Vivir”) for 2013 - 2017. This period coincides exactly with the period of the presidency of 50 year old Rafael Correa, who was re-elected president in February of this year and assumed his post in May. Correa at the same time confirmed his policy of continuing the fight against poverty. In addition, political analysts say that Correa has brought a long awaited stability to Ecuador. Speaking after his election, the President thanked his supporters for their confidence in him. And to those who did not vote for him, he promised that his government would serve all without exception, and will take care of all Ecuadorians. He also expressed his willingness to compromise with political opponents. It should be noted that the Correa government firmly and consistently delivers on its promises. According to official data, during the period from 2006 to 2011, with the help of the Ecuadorean authorities, 930,000 people managed to rise above the poverty level, which is a lot for a country with a population of 15 million. However, there is still much to do, because out of every 100 Ecuadorians, 25 still continue to live below the poverty line. The "Good Life" is part of the Civil Revolution program announced by the leader of the country, when he was still in the first term of his presidency. During the 6 years of the implementation of the program, Ecuador's economy grew at an average annual rate of 4.3 %, outperforming the index throughout Latin America as a whole (3.5%). The “Good Life" plan set as its main objectives: the modernization of Ecuador, the eradication of extreme poverty in the country, and an improvement in the welfare of all Ecuadorians. The plan also includes political and economic reform, the creation of a modern infrastructure, provision of affordable housing to those in need, and a breakthrough in science and education. In total, it lists more than 100 objectives. The achievement of them should lead to the construction of the "Good Life" under socialism in the country, under the predominant control of the state with the parallel development of democracy, the formation of people's participation in governance and the creation of a society "in which a person will stand above the rule of capital". It is planned to spend a total of $ 70 billion on implementing the National Plan. It should be noted that the majority of people believe in President Correa and are willing to follow his instructions. The leader’s ratings in opinion polls are quite high and are estimated variously from 60 to 70 %. Recently, Rafael Correa earned the respect of the masses by his seemingly unexpected and extravagant actions – his sporting achievements. He became the first president of Ecuador to conquer two difficult mountain peaks. Firstly by climbing Iliniza Norte, at a height 5116 meters. Next he conquered Mount Cotopaxi, towering over the country at 5897 meters. The president described his ascent as not mountaineering, but "Andeaneering" after the Andes Mountains. It is joked in Ecuador that the only thing remaining for Rafael Correa to conquer is the most famous and highest peak in the country, the Chimborazo volcano, at a height of 6310 meters. “I am always ready to conquer higher and more difficult peaks for my homeland", Ecuador's president told reporters at the time. The words of Rafael Correa "Development is the incessant process of learning" have become a maxim in Ecuador. Under his leadership, the government attaches great importance to the improvement of the education system. For example, under Correa access to the Internet for Ecuadorians rose from 6% to 55% of the total population. The task is to create a science city in Yachay (Yachay City of knowledge) with a new university, which will develop innovative programs for the national industries, and build the Amazon Ikiam University. These plans are already under way. Among the strategic objectives of the Government of Ecuador under President Rafael Correa, is the achievement of a fully energy independent country by increasing their own production of oil and gas, and the construction of new hydropower and thermal power plants. They also plan to construct their own national petrochemical plants and refineries. And for that, Ecuadorians will rely heavily on Russian assistance. Also, it is worth mentioning our joint and mutually beneficial plans over the last several years, which are in the process of implementation. Russian- Ecuadorian relations, both in the political and trade- economic spheres, and also in the scientific, military, technological, educational and cultural spheres, are developing dynamically. Although not so smoothly and stably as might be hoped for by both sides. But the important thing is that the process is continuing positively. 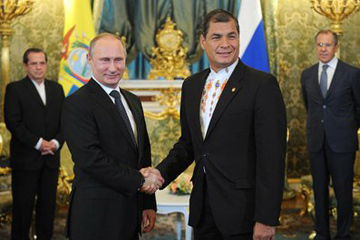 Russia currently considers Ecuador to be one of its leading partners in economic trade in Latin America. Our exports to the South American country on the equator include: fertilizers, paper, medical equipment, metal and grain. In 2012, for example, 24.8 thousand tonnes of Russian wheat was delivered to Ecuador. Ecuador supplies our country with tropical fruits, flowers, coffee, and also seafood: there are 36 fish processing plants in Ecuador with the right to export their products to the Russian Federation. These are the facts, according to experts. Also, we are developing our relationships in such strategic areas as the energy sector. For example, by 2015 Russian companies plan to complete the construction of a hydroelectric plant in Ecuador, at Toachi - Pilaton, which includes the Sarapulio and Alyurikin power plants. All the necessary equipment will be supplied by Russia. The commissioning of these projects will allow Ecuador to secure energy independence. Here is some more recent news: "Inter RAO –Export LLC" and the State Corporation "SELEK” recently signed a contract to build a gas turbine and also to build a turbine at the “Termogas - Machala" thermal power plant. It will be the first thermal power plant in Ecuador operating on a steam-gas cycle. Its installed capacity will increase from 170 MW to 300 MW. The contract includes the design, supply, construction, installation and commissioning of a gas turbine and a steam turbine, and also the construction of power lines and the expansion of two “turn-key” electrical substations. The cost of the project is $ 230 million. It will be financed by borrowing from "Eximbank" JSC and the loan will be guaranteed by the government of Ecuador. This is the second contract to be signed by the "Inter RAO" Group with the South American republic. Previously, a project was launched to supply equipment for "Toachi - Pilaton" hydropower plant worth $ 150 million. In the coming years the Ecuadorian side plans to actively develop metallurgy and petrochemical complexes. They are also planning to invite Russian state and private companies to participate in national projects in Ecuador, as they are known to posses the largest and most experience in these fields. An important step in the development of our relations was the fact that in November last year, an agreement came into force between Russia and Ecuador on the mutual abolition of the visa regime. It allows Russian citizens to stay in the South American republic for up to three months, with nothing but a valid passport. The same goes for Ecuadorians visiting Russia. The only exceptions are citizens carrying out a visit for business or commercial purposes. In these cases, a visa still needs to be arranged. Very slowly, almost imperceptibly, tourism between the two countries is growing. According to the Ministry of Tourism of Ecuador, of the nearly 1.5 million foreign visitors who visit the South American republic, there were only 2 -3 hundred Russians. It is expected that a visa-free regime will increase the flow of tourists from Russia many fold. However, it would be useful to add another transportation component: direct flights from Moscow to Quito, and Quito to Moscow. But this issue is closely related to the situation on the air travel market. Those of our tourists, who visited Ecuador, mainly visited the Galapagos Islands and the Ecuadorian Amazon. So, according to local experts, the potential is nowhere near being fully exploited. Ecuador admits that Russia is a priority market, and so they are going to do everything possible to attract more and more tourists from our country. Also, Russian travel operators are intensifying their work in the Ecuadorian market. But to attract Ecuadorians to our country is even more difficult than to attract Russians to their country on the equator. However, students from Ecuador do go to study in Russian universities. According to the Embassy of the Republic in Moscow, we have trained dozens of young Ecuadorian citizens. And their number is expected to increase. Recently in Quito, the second meeting of the Russian- Ecuadorian intergovernmental commission on trade and economic cooperation successfully took place. It was held in the Ecuadorian capital on the 24th and 25th of September. The opening ceremony was attended by the co-chairs of the Commission. From the Ecuadorian side was Minister Rafael Poveda, and from our side, the Director of the Federal Service for Veterinary and Phytosanitary Supervision, Sergei Dankvert. The delegation worked closely together in discussing the topics of the economy, trade, cooperation in the field of agriculture and fisheries, as well as issues of strategic sectors. It was officially reported that at the meeting that our side confirmed the readiness of Russian companies and investors to work on projects related to agriculture, energy, communications, and many others, which are of particular interest for Ecuador. The key issues of our cooperation were analyzed and discussed, and important decisions on development cooperation were agreed and adopted. As for the work of the Commission itself, the parties agreed to strengthen its part in relation to cooperation in the fields of science and culture. My guess is that many of the conclusions of the Commission will be the basis for the signing of new mutually beneficial agreements. From the outset, the government of Rafael Correa adopted a policy of reconstruction and modernization of the country, and on the intensification of a fairer and more effective internal and foreign policy in the interests of the broad masses of Ecuadorians. The authorities have developed a plan for the economic development of the republic, adopted broad and specific social programs, and strengthened external economic activity. All the steps taken have already begun to bear positive fruits. The people already feel that their lives are experiencing changes for the better. Ecuador truly believes in their national leader, whose popularity remains high. Ecuador is full of hope for a better future, and Russia, for its part, believes in Ecuador as a partner. 473: 30 seconds to mars. Ecuador is full of hope5 November 2013: Ecuador is full of hope! лучшие комедии. Ecuador is full of hope.